This research work investigated the influence of biofield treatment on Enterobacter cloacae (ATCC 13047) against antimicrobial susceptibility. Two sets of ATCC samples were taken in this experiment and denoted as A and B. ATCC A sample was revived and divided into two parts Gr. I (control) and Gr. II (revived); likewise, ATCC B was labeled as Gr. III (lyophilized). Group II and III were given with biofield treatment. The control and treatment groups of E. cloacae cells were tested with respect to antimicrobial susceptibility, biochemical reactions pattern and biotype number. The result showed significant decrease in the minimum inhibitory concentration (MIC) value of aztreonam and ceftazidime (≤ 8 µg/mL), as compared to control group (≥ 16 µg/mL). It was observed that 9% reaction was altered in the treated groups with respect to control out of the 33 biochemical reactions. Moreover, biotype number of this organism was substantially changed in group II (7731 7376) and group III (7710 3176) on day 10 as compared to control (7710 3376). The result suggested that biofield treatment had an impact on E. cloacae with respect to antimicrobial susceptibility, alteration of biochemical reactions pattern and biotype. Antimicrobial therapy is indicated in virtually all Enterobacter (EN) infections. The most EN species are either very resistant to many antimicrobial agents or it can develop resistance during antimicrobial therapy hence, the choice of appropriate antimicrobial agents is complicated . Enterobacter cloacae, ATCC 13047 (American type culture collection) is a clinically significant Gram-negative, facultatively-anaerobic, rod-shaped bacterium. E. cloacae is a member of the normal gut flora of humans and is not usually a primary pathogen. It is sometimes associated with urinary tract and respiratory tract infections . Many of the EN species have multiple antibiotic resistance that are undetectable in in vitro, which makes it difficult to treat in patients those are infected with this microbes. Based on existing literatures it was clearly mentioned that the organism E. cloacae had its resistance to aminopenicillins, aztreonam and broad-spectrum cephalosporins . The organisms are capable of overproducing AmpC β-lactamases by derepression of a chromosomal gene conferring the antibiotic resistance . A well-known physiologist, Willem Einthoven, in 1903 had developed electrocardiography (ECG) to measure the biofield of human body. Thus, human has the ability to harness the energy from environment or universe and can transmit into any living or nonliving object(s) around the Globe. The objects always receive the energy and responding into useful way that is called biofield energy and the process is known as biofield treatment. Afterward, the Harold Saton Burr, had performed the detailed studies on the correlation of electric current with physiological process and concluded that every single process in the human body had an electrical significance. Recently, it was discovered that all the electrical process happening in body have strong relationship with magnetic field as required by Ampere’s law, which states that the moving charge produces magnetic fields in surrounding space [5,6]. Thus, the human body emits the electromagnetic waves in form of bio-photons, which surrounds the body and it is commonly known as biofield. Therefore, the biofield consists of electromagnetic field, being generated by moving electrically charged particles (ions, cell, molecule etc.) inside the human body. Mr. Mahendra Trivedi’s biofield treatment (The Trivedi Effect®) has been known to transform the structural, physical and chemical properties of materials in several fields like materials science [7-14], agriculture [15-17], microbiology [18-20] and biotechnology [21,22]. Biofield phenomena, it may act directly on molecular structures, changing the conformation of molecules in functionally significant ways. Besides, it may transfer bioinformation interacting directly with the energy fields of life, which is known as the biofield . Due to the clinical significance of this organism, we had decided a detailed investigation was required after biofield treatment against E. cloacae. In the present work, we evaluated the effects of biofield treatment on E. cloacae in relation to antimicrobials susceptibility and biotyping based on various biochemical reactions. The E. cloacae (ATCC 13047) with two sets A and B were procured from MicroBioLogics, Inc., USA, in two different sealed packs and stored with proper storage conditions until further use. All the tested antimicrobials and biochemicals were procured from Sigma-Aldrich. After that, following parameters were evaluated in all the groups such as changes in antimicrobial susceptibility, biochemical reaction and biotype number on MicroScan Walk-Away® (Dade Behring Inc., West Sacramento, CA, USA) using Negative Breakpoint Combo 30 (NBPC 30) panel. Two ATCC samples (ATCC A and ATCC B) of E. cloacae were grouped (Gr.) and subjected to biofield treatment. ATCC A sample was revived and divided into two parts Gr. I (control) and Gr. II (revived); likewise, ATCC B was labeled as Gr. III (lyophilized). The treatment groups (II and III) were in sealed pack and handed over to Mr. Trivedi for biofield treatment under laboratory conditions. Mr. Trivedi provided the treatment through his energy transmission process to the treated groups (Gr. II and Gr. III) without touching the samples. After treatment, all treated samples were stored for analysis. Gr. II was assessed at two time point on day 5 and 10 and Gr. III was assessed on day 10. Finally, all the groups (control and treated) were investigated for antimicrobial susceptibility, biochemical reactions pattern and biotyping. Investigation of antimicrobial susceptibility of E. cloacae was carried out with the help of automated instrument, MicroScan Walk-Away® using Negative Breakpoint Combo 30 (NBPC 30) panel. The tests carried out on MicroScan were miniaturizations of the broth dilution susceptibility test that have been dehydrated. Briefly, the standardized suspension of E. cloacae were inoculated, rehydrated, and then subjected to incubation for 16h at 35°C. The detailed experimental procedures and conditions were followed as per the manufacturer's instructions. The qualitative antimicrobial susceptibility pattern (S: Susceptible, I: Intermediate, IB: Inducible β-lactamase and R: Resistant) and minimum inhibitory concentration (MIC) were determined by observing the lowest antimicrobial concentration showing inhibition of growth . The study of biochemical reactions of E. cloacae was determined by MicroScan Walk-Away®, system where, interpretation of biochemical reactions for microbial identification of Gram-negative organism in high accuracy. 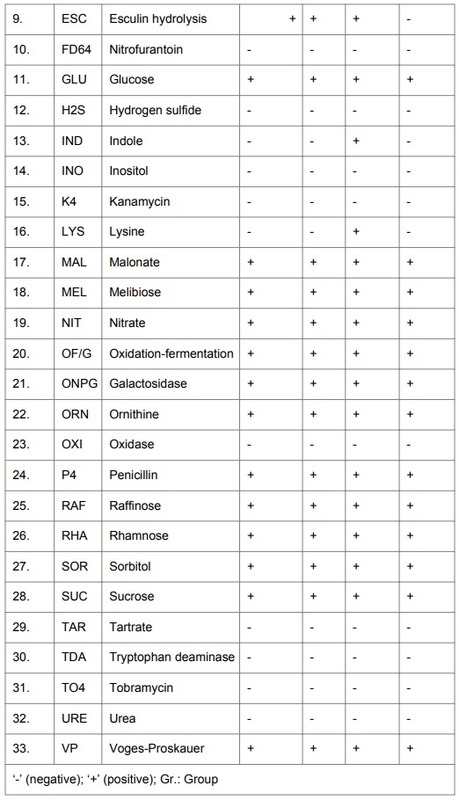 Table 1 contains the list of biochemicals, used for the biochemical reactions of E. cloacae . Table 1: Effect of biofield treatment on Enterobacter cloacae to the biochemical reaction pattern. The biotype number of E. cloacae was determined on MicroScan Walk-Away® processed panel data report with the help of biochemical reactions data [24,25]. 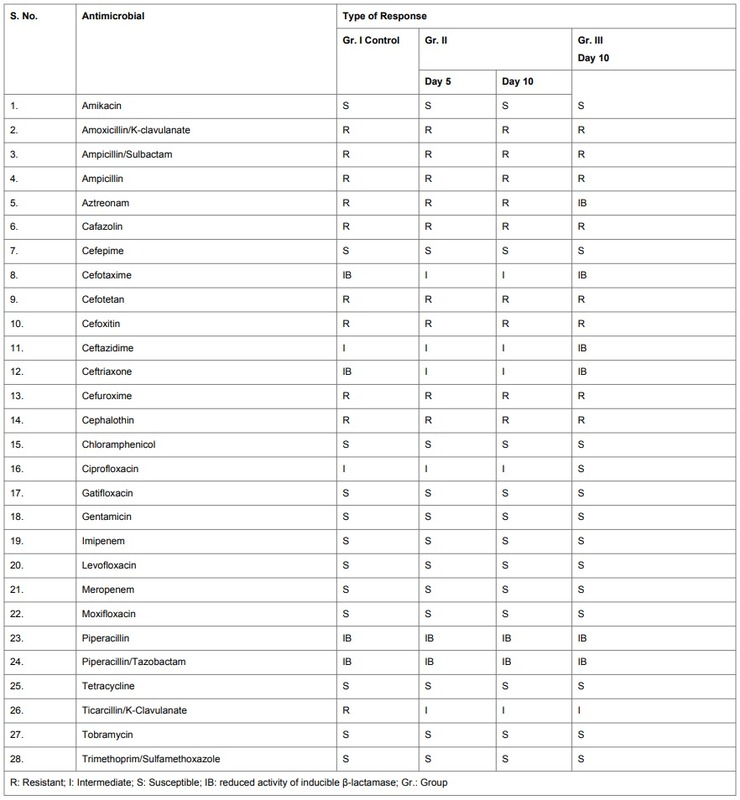 The outcome of qualitative susceptibility pattern and MIC of tested antimicrobials after biofield treatment to E. cloacae are summarized in Tables 2 and 3. The data were analyzed and compared with respect to control. The treated cells of E. cloacae showed an alteration of antimicrobial sensitivity as 14.29% in the treated group III on day 10 as compared with control. The effect of biofield treatment had revealed that the combination of ticarcillin/k-clavulanate converted from R → I corresponding MIC (>64 to 60 µg/mL) on all the treated cells with respect to control. Table 2: Antibiogram of Enterobacter cloacae: effect of biofield treatment on antimicrobial susceptibility. Ciprofloxacin and ceftazidime were converted from I → S and I → IB. The corresponding MIC values of these were 16 to ≤ 8 µg/mL and 2 to ≤ 1 µg/mL respectively on lyophilized treated cells but remained same in revived treated group with respect to control (Table 2). Table 3: Effect of biofield treatment on Enterobacter cloacae to minimum inhibitory concentration (MIC) value of tested antimicrobials. The antimicrobial sensitivity both qualitative and quantitative assessment were significantly changed in the case of aztreonam and ceftazidime as compared with respective control group, showed in Tables 2 and 3. Cefotaxime was converted from IB → I and corresponding MIC value was ≤ 8 to 32 µg/mL in revived treated group but remained same in lyophilized treated group. Others antimicrobials did not showed any changes with respect to biofield treatment in all the groups. The specific biochemicals showed some changes against E. cloacae after biofield treatment are presented in Table 3. Esculin hydrolysis was altered positive (+) to negative (-) reaction in Gr. III but remained same response in Gr. II with respect to control. Similarly, indole and lysine were changed from negative (-) to positive (+) reaction in revived treated group (Gr. II) but remain unchanged in lyophilized treated group (Gr. III) on day 10 with respective to control. Overall, 9% biochemical reactions were altered due to biofield treatment out of 33 biochemicals with respect to control. Based on the results from biochemical reactions, there were no changes in biotype in group II on day 5 as compared to control. 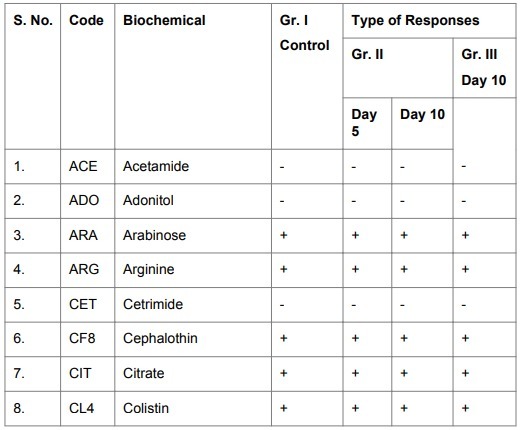 However, the significant changes were observed in the biotype number of E. cloacae in the both group II and III at day 10 as compared to control (Table 4). Table 4: Effect of biofield treatment on biotype number of Enterobacter cloacae. The existing literatures clearly mentioned that the organism E. cloacae has revealed its resistance to aminopenicillins, aztreonam and broad-spectrum cephalosporins . In this experiment, the biofield treated lyophilized form of microbe showed very satisfactory result both qualitative as well as quantitative aspect by lowering the MIC value (≤8 µg/mL) of aztreonam and ceftazidime as compared to untreated group (Tables 2 and 3). According to Joseph et al., the isolated E. cloacae has resistant to particular antibiotics such as tobramycin and amikacin . In this experiment the data showed the susceptibility of these antibiotics against E. cloacae. In presence of indole the microbe E. cloacae produced biochemical reactions i.e., negative to positive reactive in group II on day 10. The mechanism behind is that the organism can split tryptophan to form the compound indole. The positive effect directly proved that the microbe is gram negative rods shaped. The following biochemicals were remain unchanged to the strain of E. cloacae upon biofield treatment such as nitrate, citrate, Voges-Proskauer, ornithine, arginine, ONPG and OF/G. After comparison the percentage responses of 33 biochemical reaction pattern against E. cloacae was 9.0% with respect to control. Biotype numbers of particular organisms were arrived after interpreting the results of the biochemical reactions. The biotype numbers then led to the particular organism identification. In this experiment, biotyping was performed using automated systems, had found significant changes in the biofield treated groups as II and III on day 10. The biotype number of E. cloacae, which had changed from 7710 3376 (control) to 7731 7376 and 7710 3176 for treated Gr. II and Gr. III on day 10, respectively (Table 4). Due to microbial resistance to a single drug or multiple drugs, invention of an effective antimicrobial therapy for the human-wellness is urgently required. However, due to some limitation of science, the progress of new medications is slow and very challenging for scientists. Therefore, the multidrug resistant is becoming a major threat over the community. Our present research study reported that biofield treatment could change the susceptibility pattern of microbes from intermediate to susceptible and also resistance to susceptible. As a result, the microbe that was intermediate/resistance responsiveness to a particular antimicrobial now converted into completely susceptible/intermediate respectively with the same antimicrobial after biofield treatment. This may be due to change in microorganism at enzymatic and/or genetic level, which may act on receptor protein. While altering receptor protein, ligand-receptor/protein interactions may change, that could lead to show the different phenotypic characteristics . Based on these results, it is hypothesized that, biofield treatment has the opportunity to be a fast, convenient and cost effective alternative approach to combat multidrug resistance with the use of existing antimicrobial therapy in near future. Altogether, the biofield treatment altered the resistance property of a few antimicrobials against E. cloacae. It has been observed that there was an alteration in phenotype characteristics of E. cloacae. Mr. Trivedi’s biofield treatment could be applied to improve the sensitivity of antimicrobials against E. cloacae resistance and an alternative therapeutic approach to combat against antimicrobial resistance. Authors gratefully acknowledged the whole team of PD Hinduja National Hospital and MRC, Mumbai, Microbiology Lab and also thanks to Trivedi science, Trivedi testimonials and Trivedi master wellness for their support. 1. Ritchie DJ, Alexander BT, Finnegan PM (2009) New antimicrobial agents for use in the intensive care unit. Infect Dis Clin North Am 23: 665-681. 2. Barnes BJ, Wiederhold NP, Micek ST, Polish LB, Ritchie DJ (2003) Enterobacter cloacae ventriculitis successfully treated with cefepime and gentamicin: case report and review of the literature. Pharmacotherapy 23: 537-542. 3. Conceição T, Faria N, Pimentel M, Soveral G, Duarte A, et al. (2004) New chromosomal AmpC beta-lactamase in Enterobacter cloacae. Antimicrob Agents Chemother 48: 1437. 4. Mezzatesta ML, Gona F, Stefani S (2012) Enterobacter cloacae complex: clinical impact and emerging antibiotic resistance. Future Microbiol 7: 887-902. 5. Hammerschlag R, Jain S, Baldwin AL, Gronowicz G, Lutgendorf SK, et al. (2012) Biofield research: a roundtable discussion of scientific and methodological issues. J Altern Complement Med 18: 1081-1086. 6. Movaffaghi Z, Farsi M (2009) Biofield therapies: biophysical basis and biological regulations? Complement Ther Clin Pract 15: 35-37. 7. Trivedi MK, Tallapragada RM (2008) A transcendental to changing metal powder characteristics. Met Powder Rep 63: 22-28, 31. 8. Dabhade VV, Tallapragada RR, Trivedi MK (2009) Effect of external energy on atomic, crystalline and powder characteristics of antimony and bismuth powders. Bull Mater Sci 32: 471-479. 9. Trivedi MK, Tallapragada RM (2009) Effect of super consciousness external energy on atomic, crystalline and powder characteristics of carbon allotrope powders. Mater Res Innov 13: 473-480. 10. Trivedi MK, Patil S, Tallapragada RM (2012) Thought intervention through biofield changing metal powder characteristics experiments on powder characteristics at a PM plant. Future Control and Automation LNEE 173: 247-252. 11. Trivedi MK, Patil S, Tallapragada RM (2013) Effect of biofield treatment on the physical and thermal characteristics of silicon, tin and lead powders. J Material Sci Eng 2: 125. 12. Trivedi MK, Patil S, Tallapragada RM (2013) Effect of biofield treatment on the physical and thermal characteristics of vanadium pantaoxide powders. J Material Sci Eng S11: 001. 16. Sances F, Flora E, Patil S, Spence A, Shinde V (2013) Impact of biofield treatment on ginseng and organic blueberry yield. AGRIVITA J Agric Sci 35: 1991-8178. 18. Trivedi M, Patil S (2008) Impact of an external energy on Staphylococcus epidermis [ATCC –13518] in relation to antibiotic susceptibility and biochemical reactions-An experimental study. J Accord Integr Med 4: 230-235. 19. Trivedi M, S Patil (2008) Impact of an external energy on Yersinia enterocolitica [ATCC –23715] in relation to antibiotic susceptibility and biochemical reactions: An experimental study. Internet J Alternat Med 6: 2. 20. Trivedi M, Bhardwaj Y, Patil S, Shettigar H, Bulbule A (2009) Impact of an external energy on Enterococcus faecalis [ATCC-51299] in relation to antibiotic susceptibility and biochemical reactions – An experimental study. J Accord Integr Med 5: 119-130. 21. Patil SA, Nayak GB, Barve SS, Tembe RP, Khan RR (2012) Impact of biofield treatment on growth and anatomical characteristics of Pogostemon cablin Benth. Biotechnology 11: 154-162. 23. Rubik B (1994) Manual healing methods. Alternative medicine: expanding medical horizons, Washington, DC, US Government Printing Office, NIH Publication No. 094-066. 25. Gomaa FM, Tawakol WM, Abo El-Azm FI (2014) Phenotypic and genotypic detection of some antimicrobial resistance mechanisms among multidrug-resistant Acinetobacter baumannii isolated from immunocompromised patients in Egypt. Egypt J Med Microbiol 23: 99-111.